Keith Munslow, 73, of Merefield, Chorley, was fined £40 by Chorley magistrates for driving at a speed exceeding the legal 50mph. He a had to pay £85 costs and £30 victim surcharge. 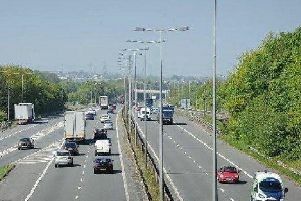 His record was endorsed with three points, The offence happened in the M6 southbound between j22-21A during a temporary speed restriction on June 26. Allan Henshaw, of Station Road, Croston, was fined £266 by Preston magistrates for driving at a speed exceeding the legal 50mph. He had to pay £85 costs and £30 victim surcharge. His record was endorsed with four points. The offence happened in Southport Road, Tarleton, on August 19. Marie Hilda Pryce, 42, of Kennett Drive, Leyland, was given a six-week prison sentence, suspended for 12 months, for stealing items worth £239, including a Calvin Klein handbag. Preston magistrates also ordered her to pay £230 compensation and £115 victim surcharge. She was also given a rehabilitation requirement. The offence happened in Leyland on January 24. Glen Clifton, of Balcarres Road, Leyland, was fined £220 by South Ribble Council for not keeping a dog on a lead. He had to pay £100 costs and £30 victim surcharge. It happened September 6. Barry Stewart, 74, of Ferndale Close, Leyland, was disqualified from driving for 29 months by Preston magistrates for driving whilst under the influence of alcohol. He also had to pay £240 fine, £85 victim surcharge and £85 coutrt costs, The offence happened in Turpin Green Lane, Leyland, on February 21. Garry Forrest, 55, of Morris Close, Leyland, was disqualified from driving for 20 months by Preston magistrates for driving whilst under the influence of alcohol. He had a £350 fine and £85 court costs. The offence happened in Maitland Street, Preston, on February 25.